“So, are we going to your mamma’s house for lunch?” I ask Paolo Turnaduri, my guide from the trekking company Etna People, when he tells me he’s from the village of Linguaglossa on Etna’s north slope. Not only does this mamma like her dishes molto piccante. She’s also a nag, badgering everyone with constant reminders that she exists. Today she’s quiet after a turbulent summer. But it seems all the locals keep a fond picture of mamma in their pocket. A chef I met had a cell screensaver showing a volcanic plume generating its own lighting (pictured above). Paolo keeps an iPhone video of “black rain,” a shower of walnut-size pumice that pummeled his car. His friend, a photographer and trinket-shop owner, displays close-proximity photographs of Etna’s brim and firestone throughout the shop, next to the pumice ashtrays and trail maps. I myself bought a couple of basalt bracelets, so now I too have my reminders. 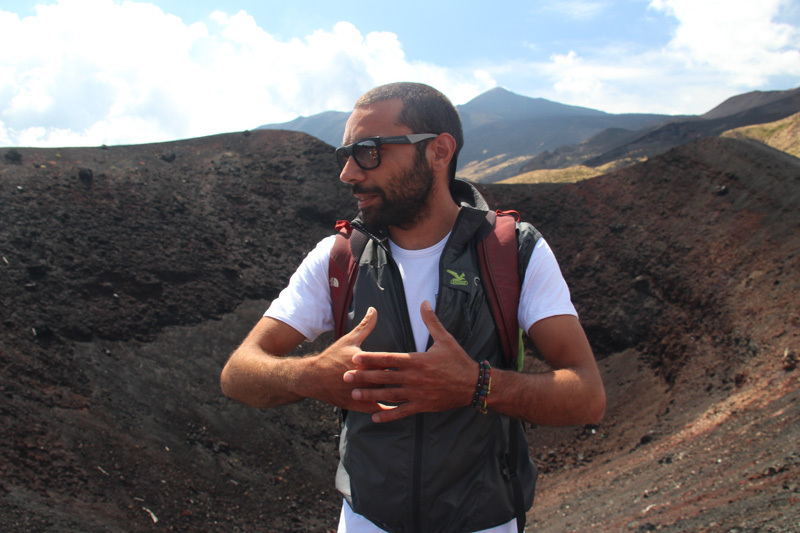 I’m here on the north face of Etna because I wanted to understand Etna DOC wine better. There’s a New Wave that’s emerged here in the past 15 years, and most of these wineries are situated on the north slope. 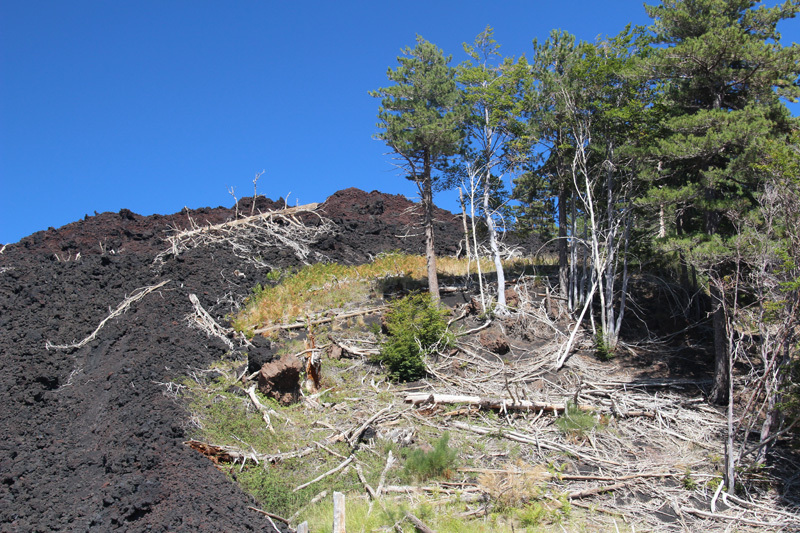 On the south side, Etna’s four major craters simmer in a desolate lunar landscape of black ash. This is the destination for mass tourism. 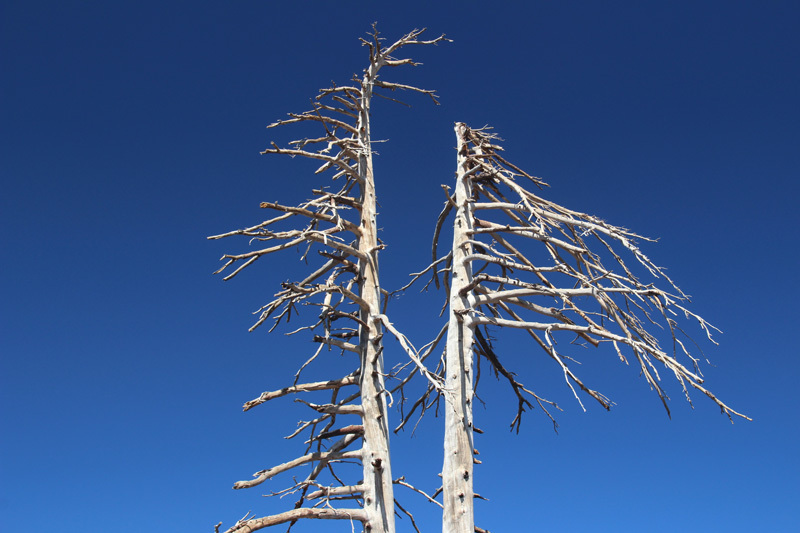 I wanted to avoid the tour buses, the funicular lines, the procession of 4-wheel drives, and the same redundant cinder ash all the way to the top. Having visited Vesuvius, I’ve been there, done that. 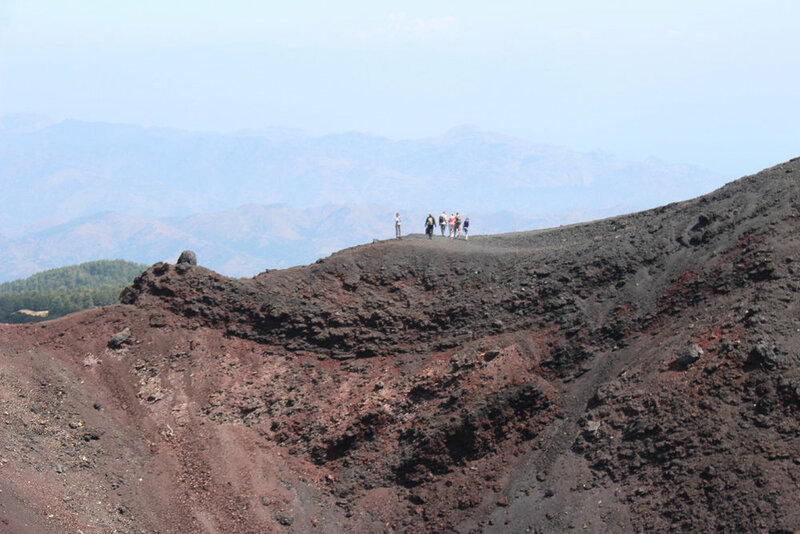 Instead, Etna People offered an all-day excursion with a variety of geographies and activities: a hike through lava fields, a descent into a lava cave, lunch at an Etna DOC winery, and river trekking in the Alcantara River Gorge, framed by towering walls of volcanic basalt. By popular vote, my group decided to go on a slightly harder trek: up the lava field of 2002. The trailhead itself makes quite an impression. A little village had sprung up here to take advantage of the tourism that came to gawk at the nearby 1973 lava field (“the first ‘commercial eruption,’ Paolo explained). Today all that’s left of it is one splintered roof peeking out from the black lava. The townsfolk thought they were safe, since the main flow was directed elsewhere, but at the last minute a side channel opened and an eight-foot wall of the black molten stuff pushed straight their way, devouring everything in its path. As we ascended, Paolo pointed out a whole range of formations and lava types—a geological vocabulary of crevices and craters, fracture and fissures and buttons. It’s like the Eskimos with their hundred words for white. 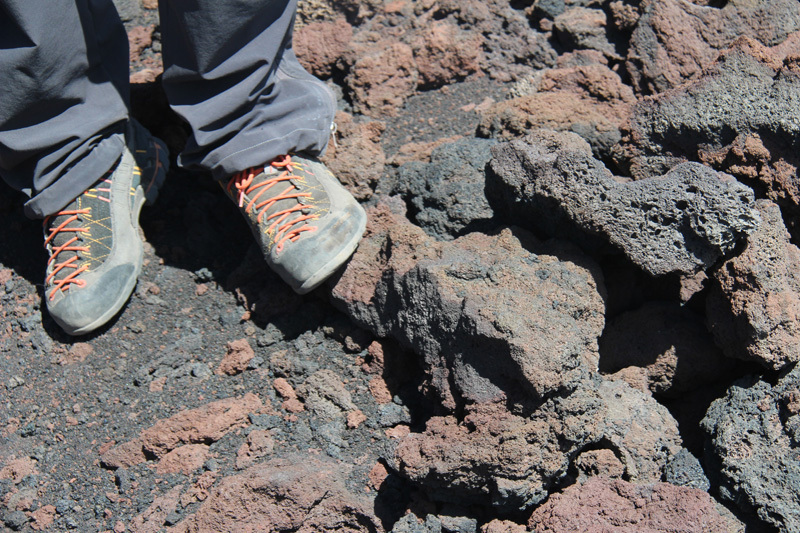 “They call this type of lava AiiAiiAii, because that’s how you sound when you walk across it,” he said, mixing anecdote with science. 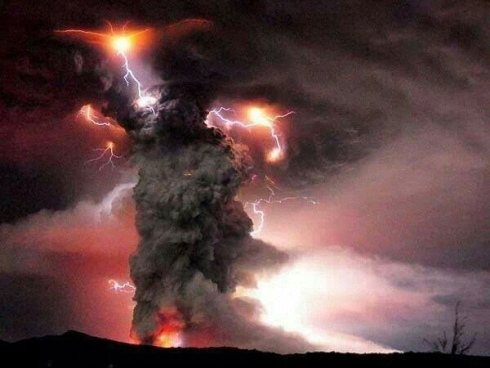 And indeed, after sliding down huge dunes of black ash and passing the skeletal remains of heat-blasted trees, we arrive back at the trailhead just as the skies let loose, with thunder and lightning and a fury worthy of the gods. That continued on and off all afternoon. 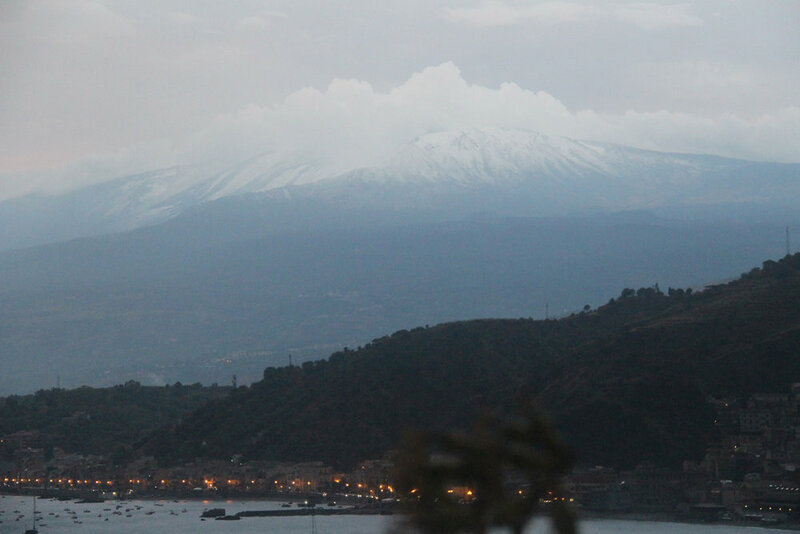 At higher elevations, the precipitation came down as hail and snow, depositing a white cap on Etna’s 3000’ peek that remained for several days. Meanwhile, we dodged showers at our other destinations: the lava cave, created when the surface cooled faster than the moving magma; and the Gole dell’ Alcantara, the narrow gorge with its towering, rippled walls of basalt. Etna makes a deep impression, one that fed into my experience of the vineyards within the Etna DOC during the days that followed. While there are other wine regions on volcanic soil around the world—Santorini, Soave, Lacryma Christi, and Pantelleria, for example—none have the firepower or the fascination of Etna. It’s a place that draws you back.